I recently wrote a blog post titled, “Why you Should NOT start a podcast“. This was an opinion piece that I wrote based on some of the frustrations of my podcast. However, after taking a look at the data and hearing some feedback from others, my opinion has evolved a bit in regards to podcasting. 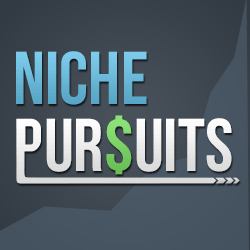 Listen in to hear what the future of the Niche Pursuits Podcast will be…along with other interesting stats about my business. This podcast is mostly a recap of my last 2 blog posts here and here. However, I also share some additional thoughts and viewpoints that I didn't mention in those posts. Now that I've re-started my podcast, I'll hope you'll check it out on iTunes, and leave me an honest rating here if you find any value! (This really helps me know that people are still engaged with the content). I always listen to your new episode Spencer and your idea of the solo show makes me love it even more. Thank you for the new podcast episode Spencer! It would be great if you could include direct mp3 download link in your podcast blog posts. I am using the DownloadHelper plugin for FF, so I can download all embedded files easily, but downloading may be a challenge for some people. That was an interesting post. Thank you for sharing your frustrations about your podcast. Over 7K downloads only 70 people visiting you link. Often, it is hard to take action when you listen to a podcast. I mostly workout or drive when I listen, so that makes it difficult to take action. You mention that you are not the best interviewer, but that doesn’t mean your podcast is not valuable. Great podcasting is not about slick presentation, but valuable content. I look forward to listening to even more podcasts! I enjoy hearing other peoples success stories and I learn a lot from them. Thanks for the book suggestions.The Education of Millionaires is one of my fav financial related books along with rich dad, poor dad. I just wanted to let you know that listen to about 5-10 hours of podcasts per week, but I do not read any blogs at all. Without your podcast, I would never have bought Long Tail Pro. The podcast made me read the Niche Site Project 2 on you blog (after you had done a podcast about that). It was the first time I visited your blog, and the posts in combination with the podcast made me by Long Tail Pro. Now I’m back to only listening to you podcast (although I’m for this post) and look forward to new episodes! Great episode. I’d rather listen to you than listen to interviews. I do my own interview podcast so I understand the frustration with the time commitment and hassle with that…but the reality is, I prefer solo shows. And if you prefer analyzing spreadsheets…think of how you can talk about that in your podcast. Yes, there are geeks like me that would love to hear how you do that and analyze the data right along with you. Just be you…we want to hear you. I’m so glad you’ll be continuing with your podcast. Add me to the list of those grateful for the podcast, found niche pursuits on iTunes, and bought LongTail Pro after getting to know the show…on my way to give an ITunes review (should have done it earlier). Thanks for bringing back the podcasts. Mixing interviews and your solo adventures are a good idea. Trust you to give us better quality podcasts. Mybe, give us quality recommendations for books to read. Way to go. Heading to itunes to leave you a good review. Thanks for continuing with the podcast, and thank you for your latest podcast. It felt like you were sharing a lot of yourself with your listeners, I am glad you wrote the Why you shouldn’t podcast article and shared your frustrations. I think it shows you are a guy that is human like the rest of us. And the fact that you are frustrated but still successful gives us all hope. I have just been over to iTunes to give you a five star review. You said in your podcast that you feel interviewing is not your forte. I just want to tell you about one of your earlier podcast interviews that I felt was amazingly helpful. and that was when you interviewed Elaine Heney about iPhone apps. You really got into details about where to find information and research about iPhone apps and how to get started. And it was immediately actionable. So to me that is excellent interviewing. and I still refer back to those show notes. Thank you Sarah for the vote of confidence! I suppose I could get more comfortable with interviewing with practice; and perhaps that day will come. But for now, I’ll move forward with the solo show for the most part to keep getting out content for everyone. 2. you seem a little nervous just talking and not interviewing … you got a great style and we listen because of you not in-spite of you !! 4. I will look forward to your new podcast schedule!! keep up the good work!! 5. Lastly — take a page from the Empire flipper guys and promote your 5 star reviews…. they really do that well!! I really like your podcast and don’t mind at all that it’s just every now and then. That keeps the quality up. I like EOFire, too, but I just can’t keep up with the amount of episodes John puts out there, so I hardly ever listen to his podcast anymore, unless there’s a guest that sounds familiar. There are a lot of interesting podcasts out there (including yours) and I don’t want to be dedicated to just one of them, so I try to catch a few from many. Long story short, please keep doing what you’re doing, maybe reduce the noise in the background, and have Perrin help out with the Podcast when you’re not feeling like podcasting. Family always comes first! Thanks for all your great content! P.S. I wish I could join your master mind group! Thanks for the kind words Daniel! Glad you changed your mind about podcasting. I like the new direction you’ve taken. It was a little surreal to hear you read my comment. I’m glad my feedback was helpful. Your insight has certainly helped me.